It gives us immense pleasure to announce today the release of PHPKB 7.0, the latest release version of our knowledge base software. The entire development team has worked very hard to make it happen on time as promised earlier. Your wishes came true and this release incorporates many of the most-wanted, requested and desired features that most of you have been looking forward to see in action. As usual, special attention is given on performance tweaks and feature enhancements. PHPKB 7.0 is more polished and enjoyable than ever before. We hope you like it. 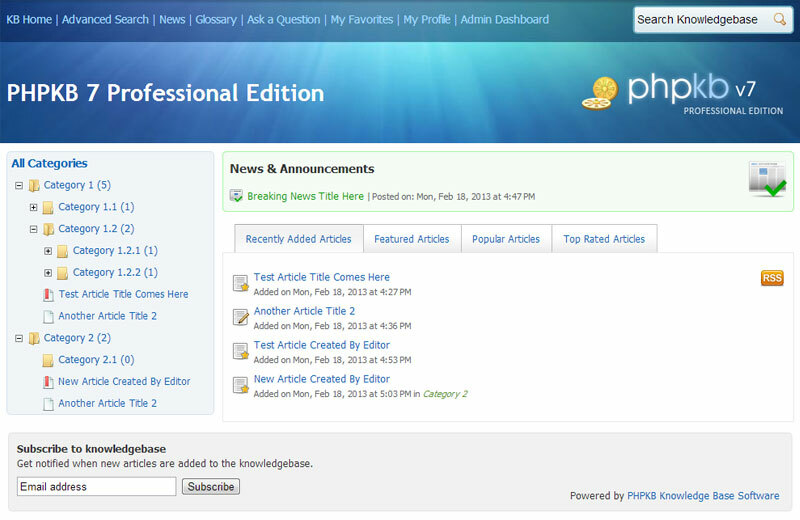 The new version is the most significant release of PHPKB knowledge base software so far. We have replaced the previously used "InnovaEditor” with "TinyMCE” as the WYSIWYG HTML editor in PHPKB 7. TinyMCE is more stable, user-friendly and feature-rich as compared to InnovaEditor. Apart from the default formatting features of TinyMCE editor, we have implemented some custom features to make content authoring experience even better. Find and Replace Text facility to make bulk changes to articles. Previously, there was no way to update a term or phrase that was used multiple times in an article but now you can do it with Find and Replace button on the new WYSIWYG editor. It's quicker than ever to make bulk changes to your user documentation, policies and procedures, news and articles that you create and update in the knowledge base. This was the most desired feature of PHPKB 7. Now, the KB administrator has the facility to restrict other admin users (editors, writers and trusted-writers) to specific categories in the knowledge base so that they can operate only in the categories assigned to them. This is done with the help of "Admin User Groups”. This way, the KB administrator (superuser) can create groups of admin users and associate them with categories in the knowledge base so that an admin user can perform his/her operations only specific to the categories assigned to his/her admin group. So, for an example, say you have 2 products in your company and 5 categories for each product in the knowledge base. Now, you (as an administrator) can create 2 admin user groups and assign them among the other admin area users (writers and editors). So, the members of "Group A” can only create, edit and manage content in the first 5 categories and the members of "Group B” can only create, edit and manage content in the other 5 categories. You, as a superuser hold full control over the entire knowledge base. In the above screenshot, a new Admin Group is created with name "Group A" and 3 categories are assigned to this group. So, the members of this group can only post content in these 3 categories. The process to attach files to your knowledge base articles gets whole lot easier with the facility to upload and manage them on "Create Article” and "Edit Article” screens. Thus, no time is wasted in first saving the article content and then uploading files to the articles. PHPKB 7 offers tree-view display of categories and articles on the end user interface to display them in a hierarchical manner for better presentation. Thanks to the on-demand loading of sub-categories and articles via AJAX technology, there is no unwanted load on your database or server resources to display them all by default. End users can open a category node to get the list of sub-categories and articles under it. Auto-save draft is a new feature in PHPKB 7 that automatically saves a snapshot of your article and news content at regular time interval, helping to reduce the risk or impact of data loss in case of a session timeout, crash or freeze! This feature can be turned on/off from the settings page. The Auto-saving is done in predefined time interval which can be configured via the settings page of admin control panel. There is also an option to manually perform the auto-save operation for work-in-progress by pressing CTRL+S keys while working in the WYSIWYG Editor. The 'Last Saved' duration is recorded and presented in real-time above the WYSIWYG editor as show below. In case you have to leave your computer for something urgent, the auto-save feature of PHPKB software is smart enough to prompt you (as shown below) about the unsaved work on your next login so that you can continue the work from where you left in the last session. You can click on the link in that alert to see the list of auto saved items that need your attention so that you can recover the auto saved data to continue working on it. We have put special emphasis on the end user interface in PHPKB 7. The most wanted requirement was to offer a 'Tree-View' to display categories hierarchically. Apart from that, it is easy to switch the end-user interface width from fixed-layout (900 pixels) to fluid-layout (100%) and vice versa whenever you need from the admin console. There is hardly any user interface change in the admin console. You probably won’t notice any changes to the admin interface at all. PHPKB 7 offers 3 different layout designs for knowledge base home page and 2 different layout designs for article page on the end user area. You can switch the layout design whenever required from the "Manage Settings" page of the admin control panel as shown in the image below. PHPKB 7.0 introduces a new and super-easy way to insert article links while creating or modifying a knowledge base article. Links to other articles are created using a specific syntax, called "Link Marker". This not only helps in keeping links organized but also makes the link management between articles easy. There is a new button (next to YouTube button) on the WYSIWYG HTML Editor for creating links to other articles in the knowledge base. Clicking on that button opens up a dialog where you can browse the categories to find out the articles for linking as shown below. Now, let us get to the intelligent part of the linking module with an example. Say "Article A" is linked in the content of "Article B" and "Article C". 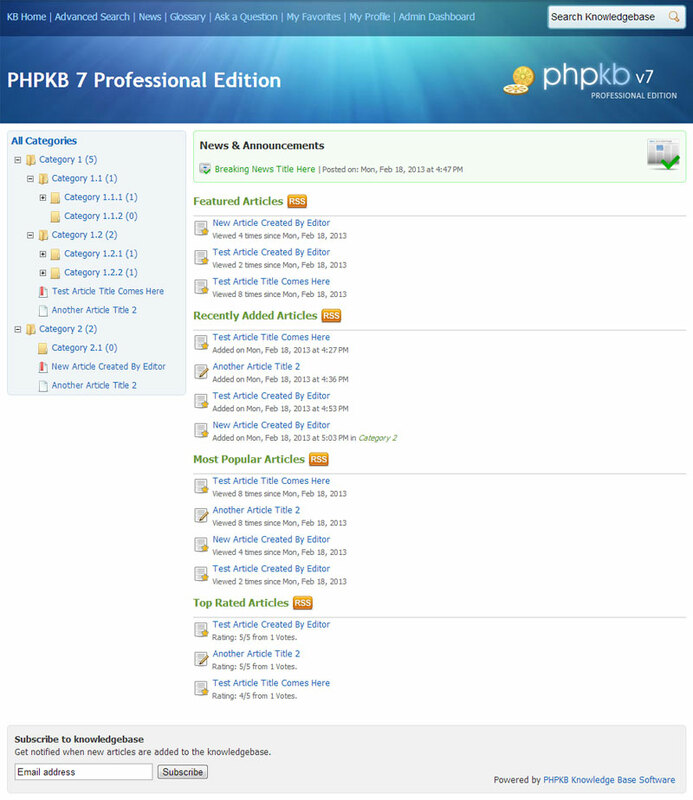 Now, when someone tries to delete "Article A" from the knowledge base, the intelligent link checking system of PHPKB software will show you a warning message along with a link (as shown below) to view the list of detected articles that contain links to "Article A" in their article body. You can then decide either to keep "Article A" in the system or delete it forcefully. 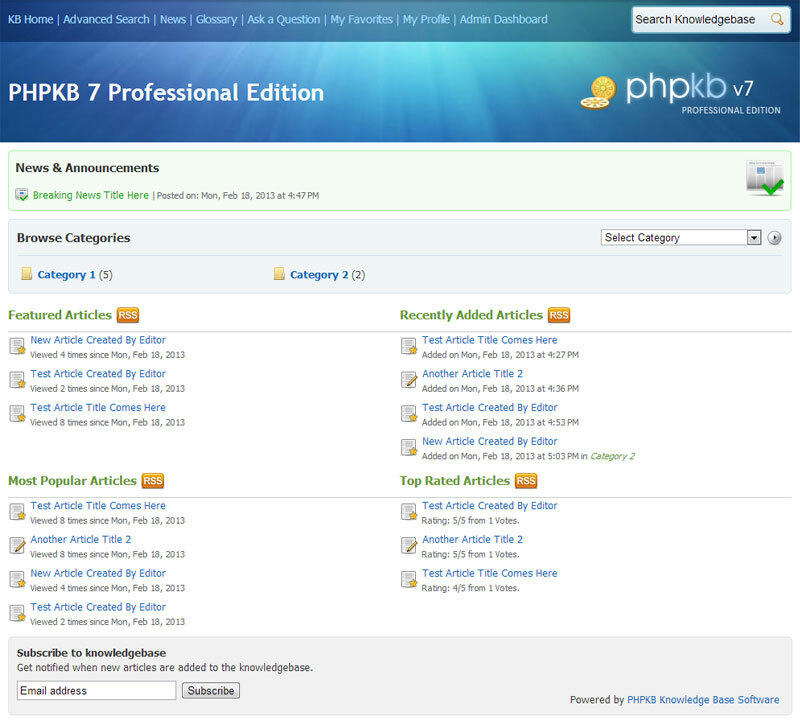 PHPKB 7 offers the scheduled publishing facility for knowledge base articles. With this facility, you can set a future publishing date for an article and the knowledge base system will automatically publish that article on the specified date. The facility to set an expiry date for articles was already present in PHPKB 6.0 version. Another new facility in version 7 is the ability to set an expiry date for news items so that the news item will stop appearing on the end-user area once it reaches its expiry date. So, it is a very useful feature to display time-bound news and announcement to the knowledge base users without remembering to remove that news manually after a certain date. With PHPKB 7, you can turn off public access to your knowledge base with the change of just one setting in the admin area so that only logged in users can access the knowledge base content. So, this was a summary of all the new features available in this release. Every day, the world's leading brands rely on PHPKB Knowledge Base Software to delight the customer and make sales and support teams more efficient and productive through unified knowledge. The introduction of PHPKB 7.0 creates new opportunities for organizations to efficiently harness their content to empower their customers and front-line employees.